In 1997, Lynette was suffering from alcohol and drug addiction. When she lost her job, she knew she needed to change her life. But she also knew she couldn’t do it on her own. 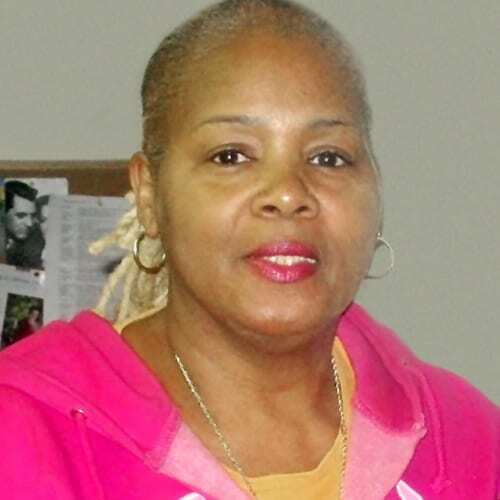 Lynette sought help at Samaritan Inns, a social services organization supported by the Foundation. Lynette distinctly remembers the way she was treated during her first visit to Samaritan Inns. She was struck by how professional and welcoming the counselor was. “She made me feel like I was important,” Lynette recollected. On August 1st, Lynette began her journey at Samaritan Inns. Lynette’s first Christmas at Samaritan Inns was her first sober holiday in many years. Along with the rest of the residents, Lynette received a special Christmas present from the Clark family that included a gift card to a local department store. She knew exactly how she wanted to spend her gift card. Lynette bought a winter coat of her very own—a warm leather jacket. Lynette successfully navigated through Samaritan Inns transition programs, and within a year she was able to secure her own housing and be reunited with her son. At this time, she also started volunteering with Samaritan Inns and was soon offered a part-time position with the organization. Lynette was honored to be able to support Samaritan Inns and its clients, just as the staff and volunteers had supported her. As her life and resources stabilized, she was even able to donate back to Samaritan Inns the leather coat she bought her first Christmas there. Today, Lynette is the Co-Director of the Affordable Housing Communities Program and has directed each of Samaritan Inns’ three programs during her time with the organization. Lynette feels uniquely positioned to serve and advocate for this population because she has “the vision of a person who has walked and lived their experiences.” This connection was reinforced recently when a woman who was early in her journey came to Lynette’s office. As Lynette looked up to greet her, she realized the woman was wearing her leather coat. This year, Lynette celebrates 20 years of sobriety.